"What can I do with my two-year-old? Now that the new baby has arrived, he's gotten so immature, like he's a baby again," Lauren's face was filled with anxiety as she told her doctor how her young son had been acting ever since she brought his little sister home. "He has potty accidents and wants to drink his milk from a baby bottle - I thought he'd be proud to be a big brother!" she said. Sound familiar? Lauren's son was doing what a lot of toddlers and preschoolers do when a new baby joins the family: regressing. Very young children are egocentrics who believe that they exist at the center of the universe and are entitled to all that position has to offer - lots of parental attention, to start with. When a new sibling comes on the scene, they wonder, "Wasn't I good enough? Is that why they brought another child home?" And of course, "Can we take her back to the hospital so I can be the baby again?" 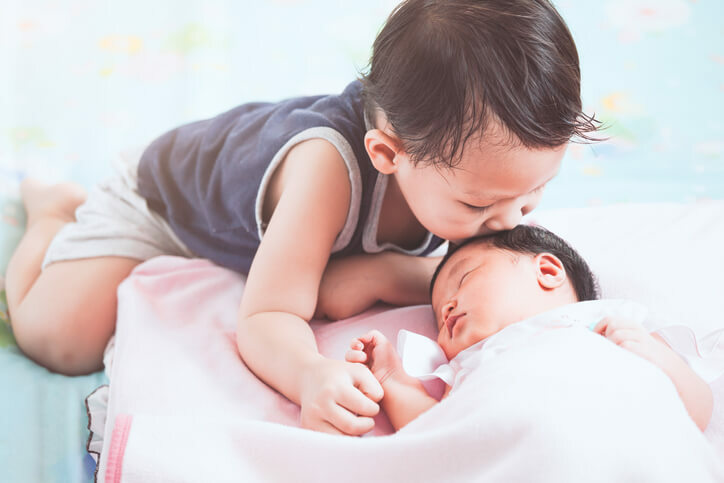 Understanding the older child's dilemma and following these five important guidelines will help you to avoid typical parenting pitfalls and bolster your little one's sense of security. Don't try to do everything alone. Enlisting the help of your spouse or a grandparent and making them full members of the parenting team helps you both devote time to each child and can give both adults some coveted alone time. Plus, cooperative effort will help all the adults in your baby's life bond with both little ones and learn how to be “on the same page” with enforcing and establishing consistent discipline policies.